You may reach the Settings panel(s) from the Settings menu. There are two ways to show the settings: either as a single panel with multiple tabs or as several panels. You may reset all or individual settings on the Reset Settings panel. 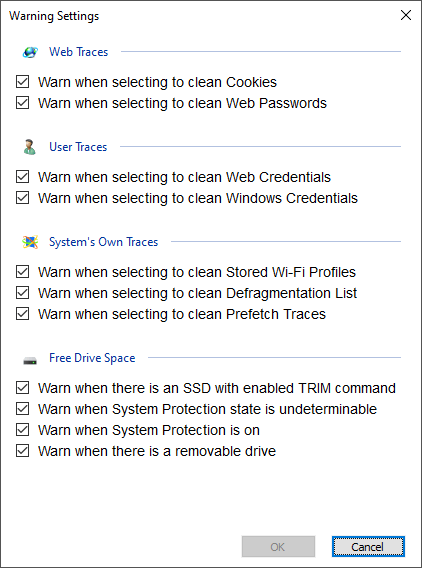 You may set default wiping setting for free drive space on this panel/tab. 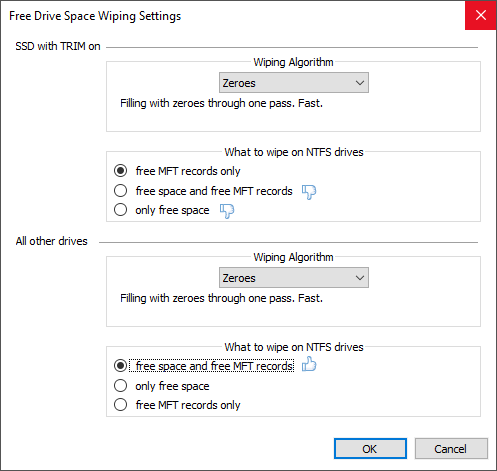 Note: There are two separate free space wiping settings for regular hard drives and SSD devices. Read the File Erasure on SSD and HDD devices page for more details. You may select a default algorithm for wiping disks. To learn more about wiping algorithms, go to Wiping Algorithms . (Effective to the NTFS file system only). 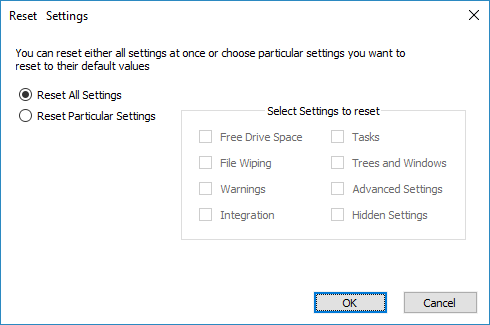 If this option is selected, R-Wipe & Clean deletes records of small files which are stored directly in the NTFS Master File Table. It also removes the names of deleted files and folders that may be stored in the disk's MFT. This is important even for SSD devices. You may set default wiping setting for separate files on this panel/tab. Select this option if you want R-Wipe & Clean wipe files before deleting to make their recovery impossible. This increases security, but also increases cleaning time. If the files are only deleted without wiping, they may be later recovered using any file unerase or recover utility. Enables/disables file wiping on SSD devices with the enabled TRIM command. Note: File wiping is not recommended for TRIM-enabled SSD devices. Read the File Erasure on SSD and HDD devices page for more details. (Effective to the NTFS file system only). 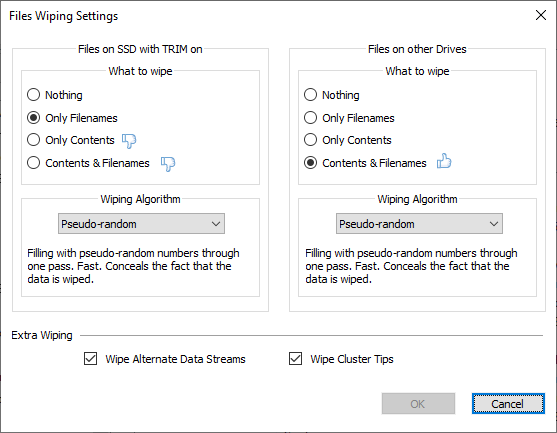 If this option is selected, R-Wipe & Clean wipes all streams associated with the file. If this option is selected, R-Wipe & Clean also wipes free parts of file clusters. You may specify setting for displaying various warnings on this panel/tab. You may set options controlling the integration of R-Wipe & Clean into your system on this panel/tab. If this option is selected, the Delete and Wipe item will be added to the shortcut menu in File Explorer. Using this item, you may delete and wipe files and folders directly from File Explorer. If this option is selected, the Add to the Wipe List item will be added to the shortcut menu in File Explorer. Using this item, you may add files and folders to a wipe list directly from File Explorer to R-Wipe & Clean or R-Wipe & Clean Smart . If this option is selected, the Wipe and Empty item will be added to the shortcut menu in the Recycle Bin . Using this item, you may wipe files and folders directly from the Recycle Bin . If this option is selected, the Wipe Free Space with R-Wipe & Clean command will be added to the shortcut menu of every logical disk. Using this item, you may wipe free disk space from the shortcut menu. You may set options controlling the execution of large wipe and clean tasks. 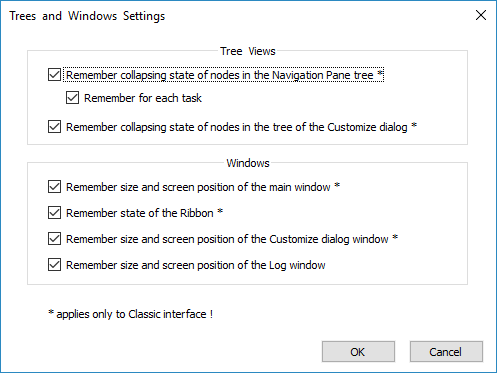 If this option is selected, the R-Wipe & Clean will immediately save changes you may make in the task tree. If this option is selected, R-Wipe & Clean will clean / wipe these files at the next system startup. 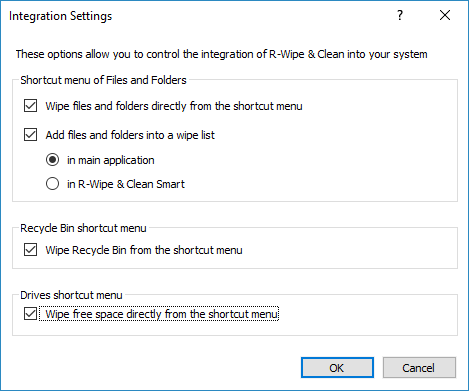 If this option is selected, the R-Wipe & Clean will not do anything and these files will not be cleaned / wiped. You may specify setting for how R-Wipe & Clean keeps the positions and states of various program windows and Tree states on the Main panel. You may set some advanced options on the Advanced tab of the Settings panel. 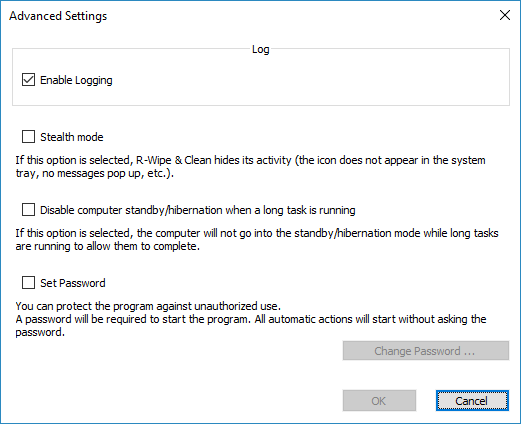 If this option is selected, R-Wipe & Clean starts logging its activity. If this option is selected, R-Wipe & Clean conceals its activity. Its icon does not appear in the system tray, no messages pop up, etc. 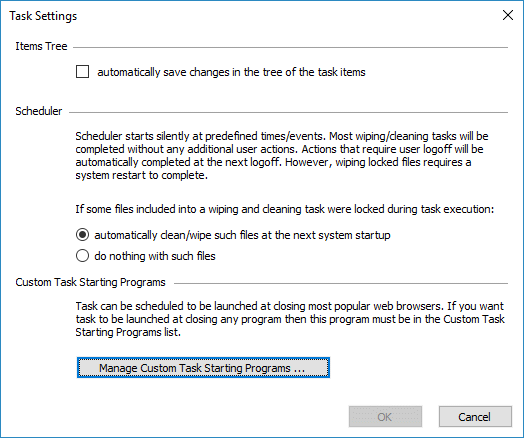 If this option is selected, your computer will not go into the standby/hibernation mode while long tasks are running allowing them to complete. You may protect the program against unauthorized use. If this option is selected, a password will be required to start R-Wipe & Clean . All automatic actions will start without asking the password.